Get Creative: Try a Cool-Off! It might sound like a refreshing summer drink, but a Cool-Off is summertime institution at the Cyberpunk Apocalypse in Pittsburgh. This is something you and your illustrator artists friends might try. You know how you get more artwork done when you have a real publication date? The Cool-Off acts as a pre-publication debut, a chance to share WIPs, Works-in-Progress. It is like TV show with no TV. In May, there were about twenty young writers/artists in attendance. Each guest is asked to put a 2 to 4 bucks into a box. Everyone sits in a big circle. They show and tell about their most recent creative endeavors. At the end of the presentations there is a vote and the winner takes home a trophy and half the kitty. Even though there is a winner, the evening’s tone is largely nonjudgmental. Some mild suggestions are made. Everyone gets applause. The Cool-Off Trophy is different for each month. May’s trophy was assembled from items that Grandpa, the house’s visiting dog, collected. Nearly half the of group I met were into comics and they shared unbound pages of works in progress. Nate McDonough showed his latest Grixly zine. Danny Mac passed around pages he was submitting to Kindlin’Quarterly magazine. Sarah (a.k.a Gunner) read a new short story. One guy totally surprised me when he pulled his project out of a bag. He made quilts from his old pajamas inspired by the master quilters of Gee’s Bend. artnoose, who I wrote about recently, read from the latest issue of her letterpress zine, Ker-bloom! The winner was a first-time visitor, Jessica Heberle. 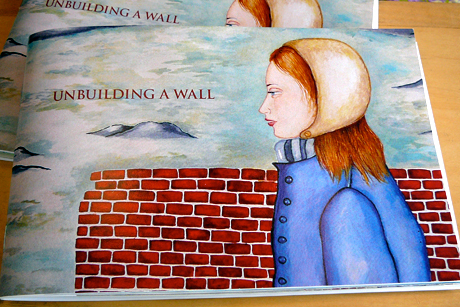 She won for her book, Unbuilding a Wall, an elaborate artist’s book, a meditation on the metaphor of the walls we build around us, between us. There is a lot of handwork involved in her project. One page had an envelope full of miniature printed bricks that might be assembled on the facing page, for example. She promises to treasure her Cool-Off trophy forever. There is another Cool-Off at the Cyberpunk Apocalypse this weekend, Sat, June 11 at 7. Calendar and directions can be found here. You aren’t near Pittsburgh? O.K. The point is, you should try this concept with your own circle of creative friends. It is guaranteed to boost your creative output! Let me know how it works out. 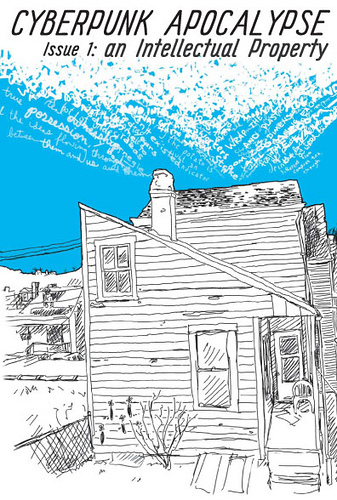 Want to get a feel for the Pittsburgh Zine Scene? Join The Cyberpunk Apocalypse Zine of the Month Club. Get a new zine every month made by the Cyberpunk Apocalites and our friends. Like the Andromeda Comic Anthology, or Kerbloom! Plus bonuses in your mailbox: letters, drawings, or letterpress cards! One year subscription is just $35.